Our canvas collages are beautifully printed and assembled with professional quality. Our in-house designers work on making the most attractive canvas collage layouts possible. 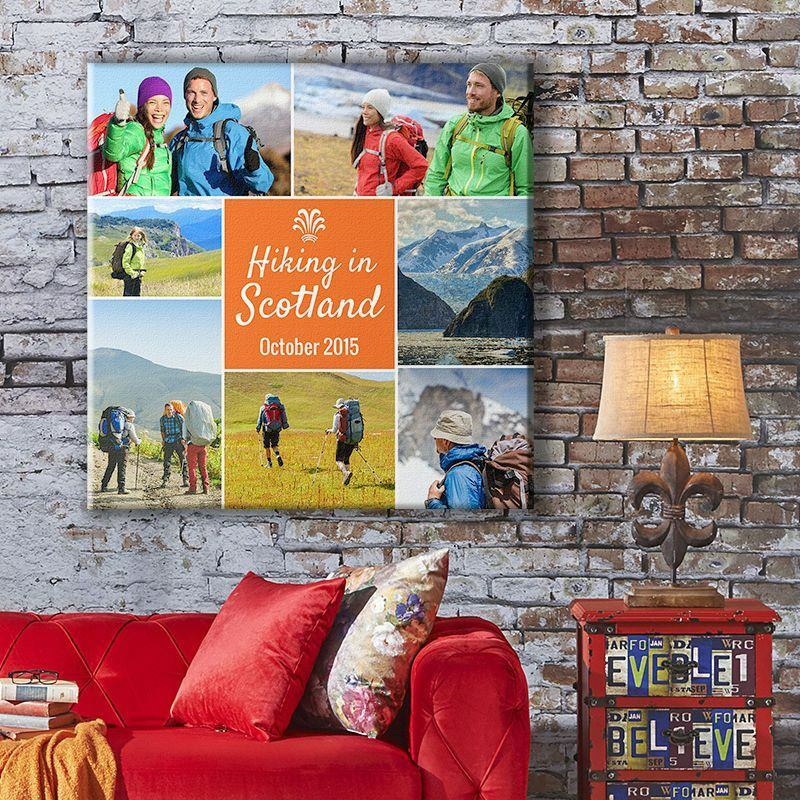 Use up to 60 images to create a great unique and personalized display on a collage canvas. Perfect for the home to show off your favorite images of travels, special events, or family. As with all our canvas prints, this has a lifetime guarantee. Can't decide what you want on your wall? A collage canvas is a great way to display all your favorite memories and beautiful images in one place. Like all our canvas prints, we use professional quality Dye Sublimation printing on our canvas photo collages, which gives great color reproduction and an incredible matte finish, as well as a hand crafted frame that won't warp or distort over time. Simply upload your photos and we'll do the rest - a professional designer will arrange your photographs and email you a sample of your collage canvas for approval prior to printing. Digital photos work best, but if you are supplying original prints for us to scan we charge an additional fee per image which covers the scanning and preparation process. This fee includes a digital scan at high resolution as well as some basic blemish and red eye reduction techniques if necessary. The canvas I made, 24" x 36" collage with quotes, was beautiful. It came out just as I had imagined it would. I created it to give to my boyfriend as a gift in remembrance of his dog that had died a few months ago. He absolutely loved it. It came much quicker than I had thought it would and the quality was great as well. The online creation studio is perfect because it allows you to make each picture as large as it's original quality will allow. There are a few templates which give you ways to design your canvas montage in our system: "Overlap", "Photo frame" or "Heart montage". These each have the option to be printed on a plain background, or with a photo on the background. If you prefer you can select the option to do it yourself. You will be given the chance to preview your personalized photo collage canvas before confirming your order. Once you are happy with your design, submit your order and we will get started with making it. You have a choice of frame depth - either 0.98" or 1.77" - and also a choice of wrap for your canvas. We use gallery wrap as standard, where the image continues and is wrapped around the sides of the frame (bleed). But we also offer a mirror or no wrap if you prefer, if this suits your image more. All of them are available with no charge to design, and you preview before you buy. You select the design type in the order process. We love the filmstrip idea. With a classic 3 photo or 4 photo design, or give us up to seven images and we will place them on a film-strip. It is a great way to display your favorite photographs. A panoramic filmstrip produces a contemporary, eye-catching result.